Best Brace - Golden Retrievers. Best Brace: curly coated retrievers Belinda Millichamp and Pete Miller. Our judge for the December match was Mrs Jan Andrews. Cottons Winterwell Mis Tified GSP. On behalf of the show committee I would like to thank Wendy Perera for judging this months match. 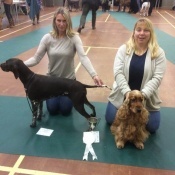 Congratulations to the winning/ reserve dogs and their owners.